Don't cancel out your vote! Date a Republican! Republican Passions is a free dating site for conservative singles. Join for free & take advantage of free email, chat, forums & more. Niche dating has exploded online, providing sites that are exclusively focused on one particular group of people (and the people who are interested in that group). 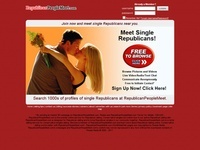 If you are interested in the Republican community, Republican Dating Connexion is the site for you. It only takes minutes to create a free account, and then you are free to check out the singles who have also been drawn to this site. You can't meet someone just by looking at the homepage, so join...and start having fun! "Meet other local Republicans! 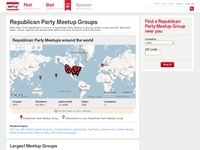 Come to a Republican Party Meetup to discuss current issues and talk about the ideas, values, agenda and policies that define and drive America's Grand Old Party." Site for conservative singles...where traditional values matter. 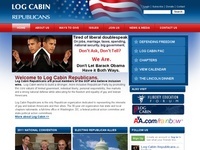 The site for gays and lesbians interested in trying to change the Republican Party from the inside. Republican Passions is a free dating site for conservative singles. Join for free & take advantage of free email, chat & more. "A free and easy-to-use discussion forum for debating serious issues seriously. 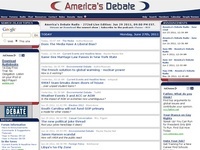 America�s Debate offers intelligent political debate for intelligent people. We operate under what is considered by many to be strict set of rules, and our volunteer staff works diligently to enforce them. America�s Debate is probably not for you if your idea of debate involves flaming and baiting people. If, however, you are looking for an outlet to voice your opinions in a civil, profanity-free manner, you are definitely at the right place. We are confident that you will find America�s Debate to be very stimulating and very challenging." 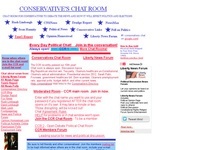 "Chat Room for conservatives to debate the news and how it will effect politics and elections."